Written by Adam on July 23, 2018. Updated April 24, 2019. 30 min read. Personal, Financial Independence, Investing. 10 comments. At the end of every quarter, I share a snapshot of my current finances. This includes what I’m invested in, their values and the change over time. The goal in sharing this information is to show it’s possible to make money investing in super-simple ways without the need to watch the latest news. If you want to look back at past investment reports, you can view them all in one handy place. My hope is that people realize how easy it is to invest and take control of their own investments. Whether that’s reading a book on the topic, taking my free investing course, or looking at what others are doing and learning from that. When I learned to invest it was a combination of all of these, and I always wished more people shared the nitty-gritty of their own decision making. I hope this helps to highlight what I’m investing in, why, and get feedback from people more experienced than myself about ways to improve. Before getting started – just a heads up – this post is kind of long. This is the process I go through to look back at my investments and spending and decide what changes to make. 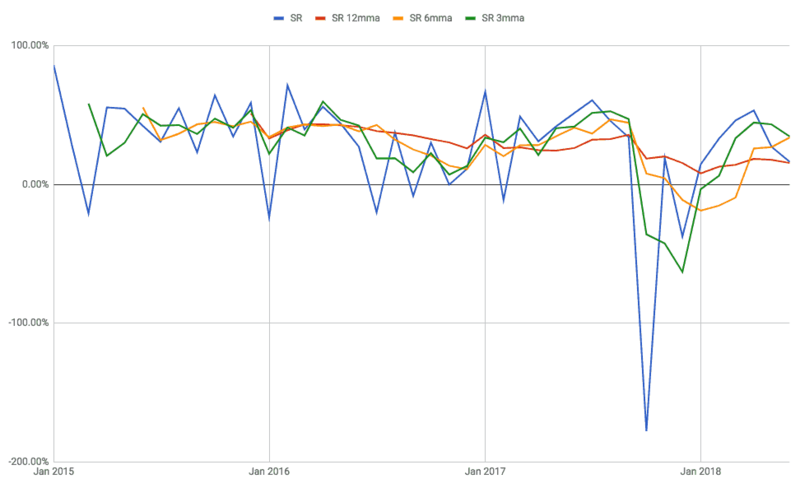 This post will be long, but it’s a good dive into an entire quarter of tracking and work. After a rough Q2, stocks rebounded slightly but ended the quarter mostly flat. I’ve managed to invest a little bit, but overall my assets have ended level. 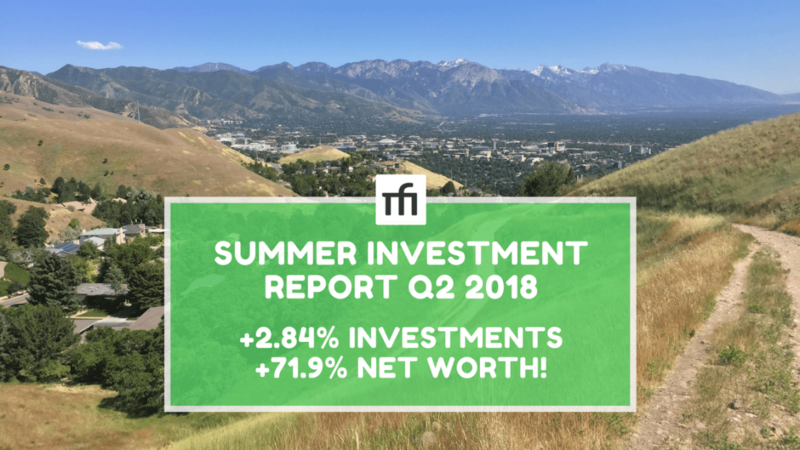 During this quarter, my investments increased by 2.84% from $1,202,654.00 to $1,236,856.00. This raises the value slightly above where it was at the end of 2017, but not by much. It’s nice to see things moving back in the upward direction after a down quarter. My investments are in blue, my elephant collection is in green. Slow and steady rise upwards! But what’s up with the (literal) elephant at $2,068,156.00? Hello, that’s kind of big deal right? Ok, storytime! Over 7 years ago I started working at Code School. The company was tiny, having just launched a month before I joined. It was a dream job – working with incredibly smart people on fun and challenging topics while also getting to make a difference to people learning how to code. I still work at the company that would eventually acquire Code School today, and it’s also amazing. I often say I was at the right place, at the right time and put in as much effort as I could. I put in more nights and weekends than I’d care to admit throughout my early 30s there. It even became a running joke (in a good way) that a problem would come up then Adam would work through the weekend and develop a solution and bring it Monday morning. Those hours didn’t seem like work! I loved solving these problems and it had the added bonus of helping the company. The result of all this was doing my part to help grow the company while progressing to a leadership role (something like a CTO). 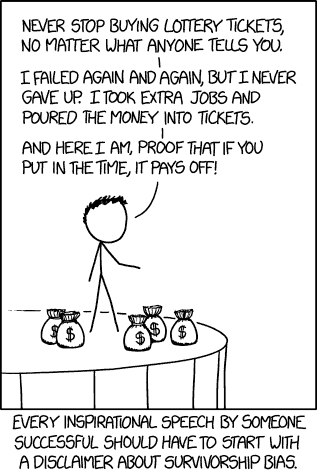 When Code School was acquired, I got a very respectable payout that instantly reduced my working years by about a decade. As part of that deal, I also got some stock in the company that acquired us. With no easy way to sell it, I tried to ignore it. Unlike a house, a car or a stock, I couldn’t liquidate it, so I didn’t include it in my net worth. Fast forward 4 years to 2018. I’m still working at the company that acquired Code School and building amazing things with an amazing team. That company (which you can Google) recently decided to go public. I’ve never worked at a public company before, so it’s been an exciting, unique experience. After years investing in stocks, it’s felt like a look behind the curtain into how the process works. Last month, on the day before my 36th birthday, they went public! Overnight my paper value went up an eye-boggling amount. All the sudden my net worth jumped by two-thirds overnight! I’m still reeling from the experience a month later. It’s rare in this world that something works out as well as this has for me. So why is this considered net worth and not part of my investments? Well, that’s something I’m going to be vague on. I own the investment and that’s all I’ll say there. The rest of the investments are considered passive investments I can sell at any time as part of the 4% rule. If your yearly spending is under $80k, does this mean you’re FI now?! No. Sadly that’s not how this works. Net worth is not what’s used in the 4% rule, only liquid assets you can convert and sell anytime. I’ll also surely be paying a ton of taxes on these someday, which will be considered proceeds from the sale of a business – not capital gains – so there’s no shortcut to eliminate them. I’ve written about how your house doesn’t count towards the 4% rule – well neither does this. This all is still completely stunning and new to me. Seeing my net worth almost double in a month after saving and investing for over a decade makes me as an extreme outlier in the jackpot/lottery realm. I’m extremely fortunate to have had this opportunity – one that very few people get. I’ve also followed a well-beaten path to FI – make a lot of money and don’t have kids. I know many who have worked as hard or harder than I have who haven’t received this kind of payout. Again, I credit this towards being at the right place at the right time and working as hard as I could. The business gain side of my story is most interesting here on Minafi as it relates to goals and mindset – so that’s what I talk about instead. If I knew reproducible steps for creating a massive company I’d be blogging about that. Instead, the part I’m most passionate about is developing great habits, investing in yourself, having a growth mindset, becoming useful in your job and solving problems that help others. For me, if every day at a job I’m thinking “if I work this weekend then maybe my stock will be worth more” that wouldn’t have motivated me to do it. Instead, if the reason I work more is tied back to habits and a personal mission it doesn’t seem like work. When I look back at what makes up the $2,068,156.00 number, it comes down to some hard work and way too much luck. $100,000 inherited when my mom passed away. $150,000 from selling my moms house. $400,000 from Code School sale. $800,000 from the company going public. $600,000 from saving and investing. That’s around $1,250,000 right there from 4 windfalls each over the course of my life. I’m listing that here not to brag, but to be completely transparent about what’s led to this huge a number by this early an age (36 for me). The other $600k is a combination of saving money over the last decade combined with investment gains. Those gains were able to start with the money I’d inherited and gain momentum with additional savings. If I were to ballpark it, if I hadn’t been lucky enough to join Code School when I did (and nothing else in my life changed) then I’d likely have around $750k saved up (I’m assuming a slightly higher salary if I wasn’t working at a startup). In addition to building kickass stuff, it ended up netting me close to $1.25 million total (!). Cut out the inheritance as well and my total investments today could be as low as $0. I needed a kick to get started on my investment journey. Without a catalyst, the most worn path through life involves working, saving 10% of your income and retiring at 65. Everyone who bucks that trend has their own catalyst for it – something that started their journey. What’s yours? Save money and invest it in passive index funds. Invest in real estate, specifically the cash flow positive kind with renters. Build a business/work at a company that has a financial event. Build a business that gives off income. I focused heavily on #1 and accidentally hit on #3 in my career. Maybe Minafi will become #4 someday. Others achieve amazing things by going the real estate route. I’d say it’s actually much less work and safer than building a business, with a higher likelihood of a payout if you know what you’re doing. Working at a startup or to help grow a business will either pay off or it won’t. If you’re an employee (rather than an owner) if it doesn’t pay off you still get paid. For example, right now I’m trying to turn Minafi into a business. Not of the million dollar kind, but of the “pay part of my rent and give me a little more buffer” kind. Right now Minafi is just an expensive (negative cash flow) hobby. I’m fortunate enough to be able to work on it while also doing #1 from my awesome day job. OK, back to your regularly scheduled investment report. This is one of the reasons why I share my numbers here as well. I share these numbers here for the same reason – to help others learn by example and to get feedback from anyone who has advice that thinks I’d benefit from. Like with Q2 2018, there hasn’t been much change here. Most investments have stayed relatively the same. I continued adding money to these over the last quarter, but my savings rate was absolutely abysmal (as you’ll see later). I did make a few changes since my Q1 report. I decided to sell my AAPL and TSLA stocks. The main catalyst there was the additional speculative part I’m currently holding in company stock. Because of that added specificity, I wanted to move other investments to index funds. Multiple Bond Funds: I’m in 3 different bond funds, but really only need to be in 1. The problem is that these are in different accounts – my 401k, my Roth IRA and a brokerage account. That means I need at least 3 different ones right there (the brokerage one could technically be the same, but I prefer the lower dividends version in my brokerage account for tax purposes). If you’re wondering why I’m in bonds in my tax-advantaged accounts, it all comes down to paying dividends. Bonds are some of the least tax-efficient holdings, up there with REITs. Because of that, I need to pay taxes on the dividends from bonds each year. If these are held in a tax-advantaged account, there’s no need to worry! If these are in a taxable account though, that means that I’ll be hit by a tax bill later. “But, if you had more stocks in your tax-advantaged accounts they’d grow tax-free!” One reason this isn’t exciting to me is that my future strategy won’t involve using a Roth IRA Ladder to access my 401k earlier. I’ll have plenty in my brokerage account to cover any spending before 60 (or at least that’s the plan). From a tax standpoint, that’s an incredibly flexible place to be – especially considering that my cost basis on the brokerage account is $700,000 on about a $900,000 value. That means that for every $100,000 of stock I sell, I’ll only pay taxes on $23,000 of it. That’s just crazy to me. If we end up only needing about $60,000 a year to live, that puts our income at $13k/year (+dividends). According to the 2018 tax rate, that’d put us in the 0% capital gains rate tier (which extends up to just over $77,000). This means that we can actually sell a lot MORE stock every year that we don’t need and then immediately reinvest in those same stocks. This is called tax-gain harvesting, and it used to take advantage of selling fund in years you’re in a low tax bracket. If my math is right, in other to extract $77,000 in value, we’d need to sell $334,000 in stock. We’ll have other income through dividends and perhaps side projects, but at that rate, we’d cycle through all of our capital gains in a mere 4 years, and the cost basis of our entire brokerage account be $0. After that, we’d have a piggy bank we could withdraw from at any time and never hit a point where we’d pay taxes. Craziness! By 5 years into retirement, our income on paper would likely be entirely from dividends. Sigh, what to do with these? They’re now roughly 2.5% of my net worth, and way down from their height at $158,845.27. That’s roughly $100,000 less than their peak. I could sell today and make about a 50% profit — $20k in short-term capital gains, for a total of about $15k after taxes. Or I could keep holding them and see what happens? I’m leaning towards just holding onto them for now. Here’s why: there is a lot of uncertainty in the markets right now. Every week there’s a new article about how the market is about to collapse, how company stock buybacks are the only thing holding up stock prices, how treasury interest rates are at a turning point or how we’re about to experience massive inflation/deflation. If any of the above happens, how will that impact cryptocurrency? I. have. no. clue. I have a feeling it will – either bringing it down to nothing or spiking it up higher than we’ve previously seen. A lot of people are drawing money out of the markets today, which means people are looking for somewhere to put it. When assets are more than 5% off track (as a percentage of my entire portfolio), or 50% off track (as a percentage of that fund’s allocation target), buy or sell funds to bring it in line with my target – even if that sale has tax repercussions. For now, I’ll just hold and see. If I end up holding these for over a year (which would be November for my “newest” coins) I’ll consider selling even to take advantage of the lower long-term capital gains tax. Each quarter I update my holdings with everything and check out how the combined allocation plays out. Here’s a look at things as of early July 2018. My asset allocation as of early July 2018. Note: The value in this chart is slightly different than 7/1/2018 because this asset allocation was done two weeks into July. I wait a week to do this in order to give room for all credit card transactions to finalize before running numbers for the previous month. These only take into account my liquid investments – not my net worth – so there’s no company stock on this one. You might notice that my bond allocation is slightly higher than most. Bonds today aren’t exactly paying out amazingly well, but I still see them as a good alternative to US/Intl for diversity purposes. I’ve written about why I still invest in bonds, and it’s still true today. Take the last 10 years for example. When the market dropped, bonds did well. If we are the verge of another market decline (which will happen, it’s just a matter of when and how) having some money in bonds will help ease the ride and help me sleep better at night. Stocks have had an amazing run lately, bonds have been extremely slow, but steady. The closer you are to needing to draw down funds from your account, the scarier a stock decline becomes. For instance, if you were to have retired back in 2007, then your first year you would’ve seen your account drop by as much as 30% or more. If instead, you held 50% bonds at that time you would’ve been sitting pretty and be able to buy into a very low market. Who knows what the next recession/downturn will bring though – I certainly don’t. Maybe stocks and bonds will both go down and we’ll switch to using Dogecoin for all transactions, who knows. What we do know is that historically a diversified portfolio has done better during a downturn than one consisting of all stocks. Home – $6,942.91. Our largest single expense every month is our rent – which comes out to $2,068.01 a month. That includes water, parking, pet rent, cable/internet (we have no other wired options for these), sewer, trash, pest control and storage unit a few feet from our apartment. The base rate is $1,820, so it’s about $240 for all of the above. Add onto that about $50/month in power, $12/mo in renters insurance (which is still hilariously cheap to me after buying homeowners insurance) and this category is mostly those expenses. We’ve picked up all the furniture we want for the place, so any ongoing costs are small things – like a rug we picked up for our patio. While we could go out and buy a house if we wanted, we really don’t want to. It’s been incredible not needing to worry about anything. After spending countless weekends doing yard work, painting and fixing things around the house, it’s felt like a vacation to live in an apartment. Mrs. Minafi and I have moved to Salt Lake City with the idea that we’ll “try it for 5 years then reevaluate”. With that context in mind, it’s one less reason to buy a house. Transportation – $2,209.00. After selling my car for $150,000 FI dollars recently, we’re down to 1 car. Mrs. Minafi’s car isn’t paid off. We could do that tomorrow if we wanted, but that’d result in various paperwork we’ve been avoiding. Instead, we’re hoping to sell it and switch to an all-wheel-drive vehicle before the winter season. About $1,000 of this is that auto loan which will be gone later. $235 for gas – mostly because of our road trip to Zion. The rest involved pre-paying insurance. Entertainment – $1,789. This category includes any entertainment in the house as well as outside of it. Going to movies, bars, Netflix and any alcohol we buy. It comes out to about 50/50 alcohol/entertainment. The alcohol side is an area we could definitely bring down. We like mixing cocktails at home, and that’s still a lot cheaper than going to bars. The entertainment side is on the high side because we bought a number of concert tickets this quarter for events throughout the summer, as well as Salt Lake City Comicon tickets for later this year. $2,200 – Zion birthday getaway! This was an amazing trip. We stayed at a beautiful glamping location, hiked the Narrows and Angels Landing, and loved every minute of it (although we were sore after the fact). A frugal person could have camped on public lands, packed sandwiches and explored canyons on their own, but this was an amazing introduction to the area. $900 – Dinner at a 3 Michelin star restaurant on vacation. This was a massive treat and an amazing experience. In retrospect though, it wasn’t worth $1,000. We could’ve eaten much cheaper at another amazing place. I think there’s something to trying an experience like this, but I don’t need to make it a common thing. $750 – Scotland trip related – flights, tours, hotels. $400 – Deposit for our stay in Yellowstone for May 2019. $300 – San Francisco trip related – hotel, Lyfts. $200 – Instapot and Air Fryer. These have been really fun to cook with so far. This brings me to a question – what category do you use for meals while on vacation? Are those considered restaurants/food? Or a travel expense? I’ve been inconsistent with how I count them – sometimes putting them as travel and other times as restaurants. For Q3, I’m planning to split out luxuries and travel to add more clarity to this group. Food – $3,114, or $1,038/month. This is broken up into about $1,600 in groceries, $1,300 in restaurants and another $200 in coffee, dessert, and snacks. This was up from last quarter quite a bit. The biggest increase here was in our grocery bill somehow growing. It didn’t seem like we spent much more than usual here. We tend to shop at the closest grocery store (Harmons) which could be described as a local Whole Foods. It’d be nice to try mixing things up and splitting time between there and Trader Joes. Education & Career – $275. Not much here. Mrs. Minafi’s cell phone bill (T-Mobile). Personal Care – $2,134 This is one category that the two of us had split onto our own credit cards and I wasn’t previously tracking all of our expenses. It’s going to start including everything both of us spend around the areas of medical, clothes, fitness, beauty supplies and personal services (haircuts, massages, etc). We hadn’t done a great job combining our finances for these and making it clear to each other how much we were spending. Travel hacking ended up being a great catalyst for getting us both on the same cards and making those expenses visible to one another. Pets – $654. Weekend Our pup spent a weekend in a doggy daycare and came down with something that required treatment. She’s good now though. Mrs. Minafi Uncategorized – $2,728. Before switching to a single credit card for both of us to spend off, we had separate cards we used to all personal expenses. We’re attempting to combine these, but have decided to declare tracking-bankruptcy and just write off these as Uncategorized. Most of these would be split between travel, food and personal care, but these happened prior to June, and some could have happened in Q1 (I used the date the credit card payment was made to determine these values, rather than the sum of transactions). We have a plan for this in Q3 now, which should make it clearer where our money is going! Spending $25k a quarter puts me on pace to spend $100k a year. This would be MUCH higher than last year ($73k), and would blow most of my FI numbers up. Seeing these numbers this high was a huge wakeup call to me to get better at identifying where we’re spending money and do better. I’d like to get Q3 down before $18,000 ($6k/month or $72k/yr) in order to better understand if this is just a fluke quarter with a bunch of unusual spending, or if this is the new normal. One major new addition here is Mrs. Minafi’s Uncategorized expenses. We joined all of our cards last month and started tracking all expenses in one place – but there were still some lingering ones that were done before that. This number will include some travel, some groceries, some luxuries, some personal care – lots all the same things that would be elsewhere. It would also include some that were paid for both of us. In my Q3 breakdown, my hope is to eliminate this uncategorized column and attribute there to their actual areas. Transportation – Even though we sold one car, this was higher than I’d like it to be. For 2 months out of this quarter, we had 2 cars, 2 insurance plans and paid for an extra parking spot. This should be lower next quarter. Travel – Another quarter with this being way higher than we’d planned. I’m slowly beginning to realize that travel is a lot more expensive when you need to cram it into a weekend or a short trip. When you’re able to do it slowly, there’s less urgency and more flexibility to cut costs. It makes me wonder if our travel expenses will naturally come down if we were to stop working (and add a little travel hacking in for good measure). There is still one large expense I’m anticipating this year: changing cars. We’re planning on selling our car and switching over to a 4-wheel drive vehicle. We’re in no rush right now, but we’ll want to get it before winter. 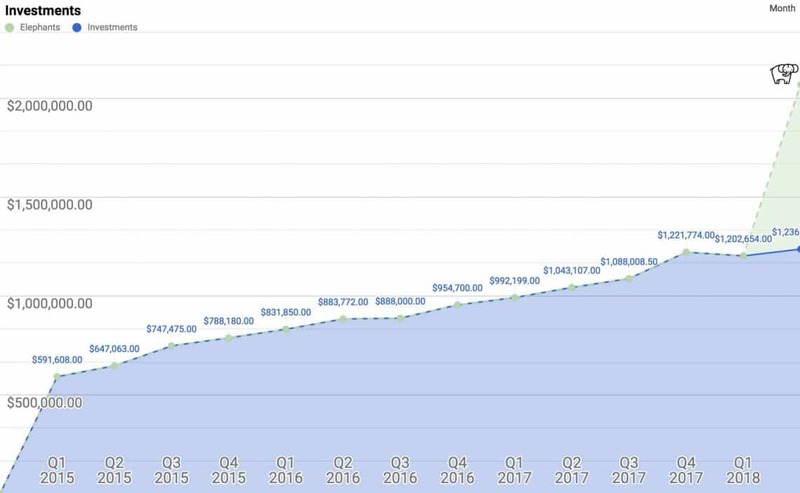 We’ve (somehow) spent $45,000 so far this year, which would put us on pace to spend $90,000 in 2018. This is significantly higher we’ll likely spend though. 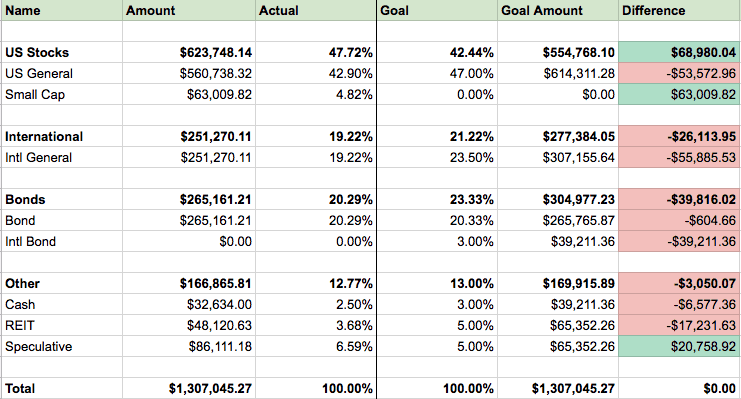 Looking at our yearly budget, the actual amount we’re aiming to spend is just under $75,000. Time will tell if that’s realistic or not. Seeing these numbers increase so drastically this quarter did put one thing into perspective – I need to start tracking my spending. I recently joined the ranks of You Need a Budget to track everything we spend. Their recent addition of an API is extremely handy for the dev in me who wants more control over this data. I have, without a doubt, let some of the exuberance of being part of an IPO coupled let my spending inch upwards recently. That’s one of my biggest takeaways from this quarter – I need to get my spending in check! We did a lot of awesome stuff this quarter – the most expensive of which was a weekend at Zion and a trip to San Francisco where we ate at a 3-Michelin star restaurant. Remove these two trips and our expense for the quarter drop around $4,500. Finding ways to travel cheaper is something that’s top of mind – especially considering how many places there are to see on my goals list. Investment wise, there isn’t much I’d change. My US Stocks allocation is slightly higher than my risk tolerance, but considering all other tax implications I have this year, I don’t think it’s worth selling to bring it in line. How did your investments do in the last 3 months of the year? Did you spend more or less than what you wanted? I’m glad to hear you’re getting on to the travel hacking band wagon! It really makes a difference and makes travel more accessible. To answer your question about counting food while traveling, I count it as food unless it is something really extravagant. As an example, The Michelin dinner though would probably count in Entertainment/ travel for me though since it was such a special occasion. I usually spend money out on weekends anyway and when we travel for long periods of time, we pick up breakfast and snacks at the grocery store to bring around. So to count it separately would make tracking much more difficult. And to your other question about a FI catalyst? Realizing I wanted to do so much more traveling than my 3 weeks of vacation allow – but also that I love my job, like you do! That limits where I can live and forces me to work in an office. Eventually, I’d like to work on more of a contract scale or part time/ consulting but it will take time to build that experience up. > I count it as food unless it is something really extravagant. That sounds like a good approach to it. Having breakfast and snacks in the room is a good idea too. There have been too many times we’ve been starving in the morning and went out for a huge lunch. If we had food in the room it’d be a lot easier. It’s so refreshing to see someone who’s a high spender (I’m sure I’ve told you many, many times). Anyway, this was an enjoyable read, and I liked hearing about your company stock windfalls–so cool! Now I need to Google that company that went public, so maybe I can get in on that stock, too. For vacation food, I count it all as vacation and not food. The reason being that our eating habits are different on vacation (more lavish). And yes, travel hacking can probably cut the travel spend in half. Let me know if you have any questions! I love to help with that stuff. Same here! I respect people that pack all their own food and eat cheaply. I love trying new local food prepared by people who are much better at it than I am too. I will also have my real estate license in a couple weeks, in case you want to invest in something back home, or you know someone here who needs help with a property. I do love a thorough breakdown, thanks for sharing! I also recently blew a large amount on a single dinner experience. Gotta live while you save. Too true! Nice to have a splurge every now and again. How many different cryptocurrencies do you own? Which ones do you feel have the potential to grow nicely in the following years? I am currently investing 5% of my income into 30 differennt cryptos like Bitcoin, Monero, Ethereum, etc. I plan on holding on to them for the next 5-10 years in hopes that 1 or more of these will grow exponentially. The risk is not big since I’m investing a small amount and I feel my chances of hitting a winner (or more hopefully) are good-ish. What do you think, Adam? I love transparency, and this article is it. I really admire you Adam for being so transparent and teaching along the way. – An extremely talented software developer. – A growth-minded individual who learned new technologies as needed and often for fun. – A risk taker who had the courage to take a chance on a startup. – A kind person who cared so much about other people, he was driven to create the best learning experiences for them. – A driven leader/teacher who empowered & mentored those around him, building everyone’s value and the value of the company itself. – A friendly person who cared enough to cultivate community inside the company and make friends, increasing morale. – A driven craftsman who took it upon himself to get the job done even if it meant working weekends. So… You might call it luck… But it feels a little like you’re not giving yourself enough credit. Good things tend to happen to people who have these qualities, not because of luck in my opinion.